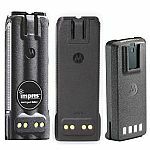 Motorola Improves Radio Battery Warranty | Magnum Electronics, Inc. This entry was posted in IMPRES, Motorola and tagged Batteries, IMPRES, Motorola, Warranty by magnumelectronics. Bookmark the permalink.